When Arizona voters approved the Medical Marijuana Act in 2010, they intended for patients to be able to access their medicine in the form most helpful to them. However, language in Arizona’s criminal code has encouraged anti-marijuana prosecutors to subject patients to potential arrest, prosecution, and prison time. People who lawfully acquire cannabis from state-licensed medical marijuana dispensaries have been arrested and prosecuted for serious felony offenses because they possessed marijuana in a form that happens to be defined as “cannabis” in our criminal code. H.B. 2149 will remove the arbitrary distinction between “marijuana” and “cannabis” in the criminal code, providing much needed clarity to medical marijuana patients. The state Attorney General and the Department of Health Services both agree that medical marijuana patients should have access to the medicine they need. We should resolve uncertainty in the criminal code in favor of the voter-approved initiative and law-abiding medical marijuana patients who should not be placed in a situation where they face arrest every time they walk out of a state-licensed dispensary. Take action today and tell your state representatives to support H.B. 2149! I am writing to urge you to support H.B. 2149. This bill will amend the language of our criminal code to ensure medical marijuana patients can get the medicine they need. When Arizona voters approved the Medical Marijuana Act in 2010, they intended for patients to be able to access their medicine in the form most helpful to them. However, because our criminal code makes an arbitrary distinction between “marijuana” and “cannabis," patients are being subjected to arrest, prosecution, and prison time for carrying medicine they purchased at state-licensed dispensaries. There are many medical marijuana patients who need to use cannabis because they are unable to smoke leafy marijuana. For example, young children who suffer from otherwise intractable seizure disorders, like epilepsy and Dravet Syndrome, find relief through medical cannabis that can be administered through oils or in food. Without H.B. 2149, these young children and their parents could face arrest and prosecution for using the medicine in this form. This is unjust. H.B. 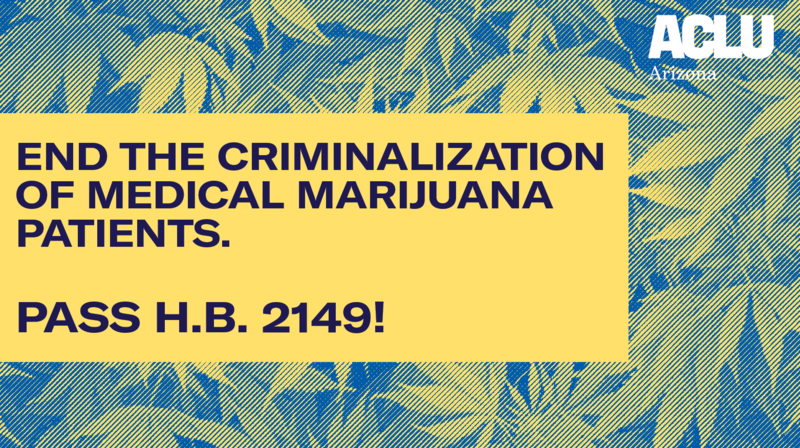 2149 will also provide much needed clarity to medical marijuana patients. The state Attorney General and the Department of Health Services both agree that medical marijuana patients should have access to the medicine they need. We should resolve uncertainty in the statutes in favor of the voter-approved initiative and law-abiding medical marijuana patients who should not be placed in a situation where they face arrest every time they walk out of a state-licensed dispensary.